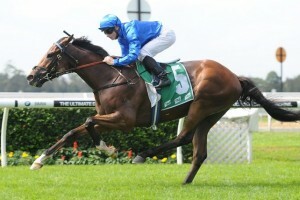 Godolphin scored their second win of the day at Warwick Farm when European import It’s Somewhat won the Group 3 Liverpool City Cup (1300m) on debut in Australia. It’s Somewhat scored the Liverpool City Cup win on debut in Australia. Photo by Steve Hart. The four-year-old gelding jumped well from barrier five, working his way up the field to sit somewhere in the middle. Coming around the home turn, It’s Somewhat worked through the leaders in a strong effort, coming strongly to hit the lead with 100m to go, winning one and a quarter lengths ahead of Helen Page’s Rudy with Peter & Paul Snowden’s Gypsy Diamond clinching third place in a photo with Malavio. It’s Somewhat has now qualified for the Group 1 Doncaster Mile (1600m) in which he will be exempt from ballot along with runner-up Rudy. Trainer John O’Shea will need to decide whether the gelding tackles the $3 million race on day one of The Championships or waits a week for the Group 1 Queen Elizabeth Stakes (2000m). “They really ran, he was still on the bridle coming up past the 700m so that was a good sign,” the trainer said. “Mac (James McDonald, jockey) obviously thinks the grounds not too bad so he cut the corner and away he went. “He was sent here to possibly be a participant in the Queen Elizabeth. He ran third in the Coral-Eclipse, which would normally be good enough to be competitive in the Queen Elizabeth but we’ll see. James McDonald rode It’s Somewhat to victory, happy with his decision to partner racing giant Godolphin. The hoop rates the gelding as more of a genuine stayer which means he’d likely be aimed towards the $4 million Queen Elizabeth Stakes. “He did a good job, keeping enough sprint in his legs today and he run really well,” the jockey said. The punters had it right once again with It’s Somewhat the market mover of the 2015 Liverpool City Cup betting after his price shortened from $7.5 into $6. Punters who backed the European at Ladbrokes.com.au will enjoy their lucrative payout.